Workplace pensions Law has changed, employers now have a legal requirement to enrol eligible employees into a pension scheme. This legislation promises to be administrative minefield for businesses – The Pensions Module add-on for Sage 50 Payroll will enable you to seamlessly integrate Pensions and Payroll into one entity, ensuring that you make a smooth transition to Auto-Enrolment. 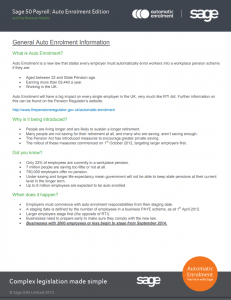 Dependent on the size of the company, staging dates for automatic enrolment began on 1st January 2014. You can find out your individual staging date here: Auto Enrolment staging dates. Do you know what an eligible employee is? 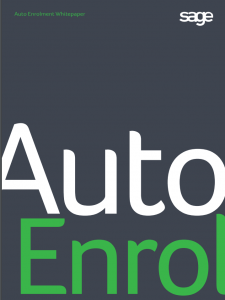 If you are already using the most recent edition of Sage 50 Payroll – Auto-Enrolment edition, then the add-on will eliminate the burden of day-to-day administration that will inevitably be involved with the transition to Auto-Enrolment. Automatically Assess your workforce – Assess your entire workforce against the Automatic-enrolment legislation at the click of a button and categorise employees into the correct pensions scheme. Automatically Manage Pensions Data and Payments – Create your pensions data in the correct format to be sent to your pension provider. Automatically Communicate with Your Employees – Create the correct, individually addressed, communication for your employees. Emails and letters prepared for you - The Pensions Module will simply notify you of when they need to be sent and keep a record of all communication.